When a play is dismissed by the Daily Mail as ‘lefty tosh’ it’s probably going to be worth seeing. I enjoyed Tamsin Oglesby’s polemical ‘Future Conditional’ which was full of debate and far from one-sided. This pacey ensemble piece which has just finished its first run at London’s Old Vic theatre exposes the contradictions, hypocrisies, prejudices and obfuscations of what passes for educational discourse in England today. The play’s action shifts rapidly from the playground where anxious parents scheme about how to navigate secondary transfer in the interest of their children, to the classroom where learning actually happens and on to the boardroom of the ‘Education and Equality Commission’ where well-meaning but clueless experts seem unable to reach any kind of agreement about policy. If some of the play’s protagonists, whether parents or policy wonks, seem a little stereotypical this is because they reflect so many of the reheated stock positions which are regularly presented to us as worthwhile educational ideas. If the spokespeople for these ideas seem a bit 2-dimensional, it’s because their ideas are pretty thin. Cutting through all of this is the story of Alia, the gifted recent arrival from Pakistan who is grateful for the education she has received in England and may have the opportunity of a place to study English at Oxford university. Alia has experienced much discrimination and family trauma before arriving in England and we see our class-ridden system through her eyes. It is Alia who has the vision and the naivety to suggest a simple practical solution to the inequity of admissions to ‘top’ universities. 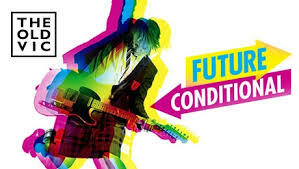 ‘Future Conditional’ is polemical in the best theatrical tradition. It judges the stories we tell ourselves to justify selection, segregation and elitism against the benchmark of fairness, universalism and equality and finds those stories unconvincing. What a pity the Daily Mail preferred to sneer at it without engaging with the argument. So thank you to Tamsin Oglesby and this great production for reminding us that if we really want an education system which offers the best possible opportunities to all young people, we need some bold new ideas to debate – including Alia’s. This entry was posted in Culture, Education policy, Reviews and tagged choice and diversity, comprehensive education, Future Conditional, Oxford university, play, selection, Tamsin Oglesby, university progression. Bookmark the permalink.